MANNA'S offers opportunity for one or all the members of the family to participate. Our environment is friendly, courteous and educational. MANNA'S values the time that you take to build your and or your family's core values, whether for fitness, self-defense, camaraderie or self-discipline. Develop strong character, integrity and self confidence. Enjoy new friendships and spirit! We invite you to visit and experience MANNA'S for yourself. We look forward to having the opportunity to meet with you and will be our honor to share with you and your family, great physical and mental guidance through MANNA'S. Many names are used to describe Korean martial arts. Our teaching offers a mix of the Korean hard style of kick and punch, today known as Tae Kwon Do, with the turning and twisting of the Chinese soft styles all directly influences by the time that the Japennese martial arts influenced the Korean culture. Our instruction and teaching efforts are toward the preservation of the classical heritage and the enhancement of the martial arts in the world today, by the controlled atmosphere of pride and complete respect and discipline. 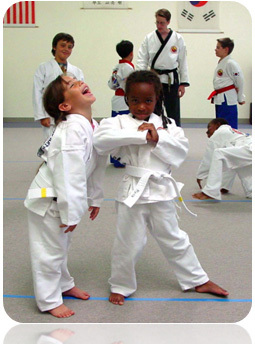 Understanding the values of the martial arts training is an in-depth study. * SELF DISCIPLINE Our traditional codes and studio rules outline the discipline which becomes self-discipline through personal application. Discipline is necessary to improve techniques and develop our hidden resources to the point where they may be utilized in practical application. 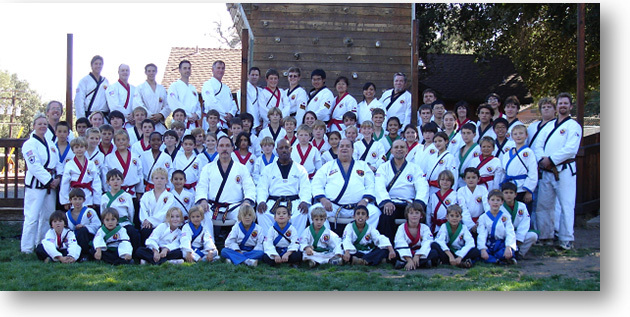 Each individual with us is taught to be responsible and to be a "thinking" martial artist. As physical ability increases, so does mental control and focus in all activities. 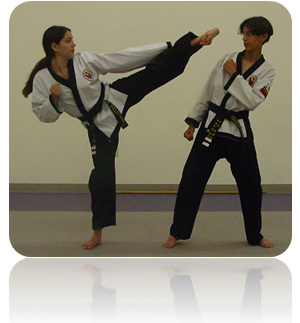 * SELF DEFENSE Through physical and mental training you can gain the ultimate use of your bodies facilities. Our teaching stress the scientific use of the body in the methods of self defense. You will acquire knowledge of pressure point, joint manipulation and take downs. Our self defense training is to disable, not to destroy. Concentrated mental and physical force can cause extreme damage, this is why our emphasis is on learning never to use this knowledge wrongly or violently. * PHYSICAL FITNESS Our classes stress four important area of fitness: Stamina - aerobic workout; Flexibility - stretching; Strength - isometrics, calisthenics and weights; and Mental and Physical Balance. Many aerobics workouts challenge only the body, and afterwards, the mind is still running on. Our training challenges the mind as well as the body. So, when the body is at rest, an overall calming effect is achieved. I call this, "The whole person concept" or balance of the mind and body. In this state, the body can truly rest and focus calmly on tasks at hand. We recommend two or three classes per week, this will enable both mental and physical enhancement. 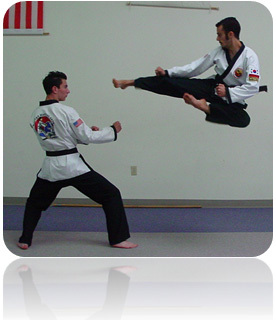 Tang Soo Do is a traditional Korean Martial Art that was influenced by the Chinese. It's origin dates back over 2,000 years. Songin Do is a culmination of years of the development of manipulation of the natural weakness of the body and the direct results of a military style, the word Songin translates to mean 'enlightenment'. It is important to remember that the term "Martial Arts" though once aptly defined as "violence and the control of that violence", literally means "military skills", and encompasses all the individual Arts. Karate, Kung-Fu, Judo, Akido and Kobujitsu complete the Oriental line of ancient Asian warfare; however, let us not forget the tactics of India, Greece, Egypt, France or the Americas. Though drastically different, all forms of the Martial Arts can be described as being either a form of sport (Judo, Wrestling, Tae Kwon Do, etc.) a "Jitsu" (combat forms) or "Do", a way of life or art (those of high cultural value and moralistic intent). Let us first examine the term "Martial"; though many stylized art forms have derived from the professional warriors, the majority of the arts still in practice today, were developed by the civilian populations, for the purpose of personal defense. However, the term "Martial" is still applicable not only in the militaristic approach with regard to instruction, but in the warrior ethic developed within each practitioner. Besides conditioning the body and improving speed, strength and coordination, studying the Martial Arts increases one's alertness and self awareness. It also teaches confidence in one's abilities to deal with the world around us. And with deeper confidence comes calmness and a sense of inner peace which can penetrate to the very depth of our being. Next, let us consider the term "Art"; any form of self expression or interpretation can be considered an art. But the highest level of artistic freedom is found, not in reproduction but in creative expression. to rely on one's resources and mental flexibility to formulate a response accurate to the needs of any given situation. So even within this simple term, we find an example of balance through seemingly contradictory views. The Martial Arts may be seen as the "control of actions", "creative reorganization" or maybe most appropriately, the "protection of freedom". The term "Do" is Japanese for "The Way" or "the Path". The Way to inner peace is through the control of outer disorder. The way of self-discipline is the path to self-control; and once in control of ourselves, we find that we have the power to aid in the control of our environment. The coordination of body and mind produced great power, and with great power comes great responsibility. Once properly directed and focused, "Do" may be a source of unlimited creative energy. The roots of the Martial Arts per-date any written history, from the time that cavemen first lifted a hand in a fighting manner and prescribed dances for different illnesses. Different movements were believed to heal certain ailments, and surely a crude form of physical therapy did come of these, however unscientific the methods of development may have been. In 2250 B.C., during the Hsia Dynasty, Emperor Yu noticed that a pond of water collected diseases whereas a running stream stayed more pure. He then ordered that his people should exercise in sequenced patterns, and with this, first placed the emphasis on the prevention of diseases rather than just their cure. These movements may well have laid the ground work for Tai Chi Chuan, many centuries later. During the Chou Dynasty (1150 B.C. ), early Taoist and Confucian texts, including the I Ching (the book of Changes), the Shin Ching (the Book of Poems) and much later even the Li Chi (the book of Ceremonies & Rites) mentioned the Martial Arts and gave us the Kung-Fu Hexagram, the symbol of "strong yielding". Much of the information that has been complied with regard to the "Warrior Arts" of early civilizations has been found in the other art forms of its culture. Statues, pottery and paintings on temple walls which depict combat between two or more warriors, or in some cases, athletes, have been found in all corners of the world. In ancient Egypt, art work on the walls of Beni-Hassan's tomb depicts techniques similar to those found in Ju-Jitsu. It is still an issue of great debate as to who was first, or who was best, however the first organized school of combat seems to have been the Palaestra, a school of wrestling in ancient Greece. Greek boxing experienced its classic era from the time of Homer to the close of the 5th century B.C., and may have been the first art to utilize the "open-hand" as a weapon. The art of Pankration (all powers), a mix of Greek boxing and wrestling was carried across the Himalayas and into China by Alexander the Great in 326 B.C. The Pyrrhic Dance (a war-dance similar to modern karate form), Greek forms of wrestling and especially the art of Pankration are said to have directly influenced the Indian arts of Nata and Vajramushti. These early Indian arts, once coupled with the Buddhist teachings, gave birth to Yoga and later Kalari Payat. Just per-dating the appearance of Buddhism, in the early 200's A.D. (Han Dynasty of China) a famous Chinese surgeon named Hua-To imitated movements of the deer, bear, tiger, monkey and the birds for their health aspects. Later these movements were refined for the First Emperor of Sung Dynasty, Tai-Chung, and became the root of modern-day calisthenics. China and its people have long exhibited the incredible ability to absorb almost any culture or its ideologies. Today there are several hundred styles of Kung-Fu, the essence of which came from culmination of many cultures, philosophies, geographical origins and technical genre. Obviously a complete and comprehensive study of the Chinese Arts would be too voluminous to include in this Member's Handbook, so let us simply examine China's most famous "melting-pot." The T'ang Dynasty (618-907 A.D.) witnessed a great rise in popularity for the Shaolin Temple and its arts. It was during this period that the monks first served a military purpose and became, in affect, a special detachment of the Imperial Army. In quelling internal uprisings and resisting many different invasions, the inhabitants of the Shaolin were rewarded with many honors, citations and huge amounts of land. On this land many temples were built, the first was the second Shaolin in the Fukein province. Priests, soldiers, statesmen and scholars, while visiting and studying at these Chinese monasteries,, were undoubtedly exposed to Chan-Fa and returned to Korea, Japan and the Ryukyu with the seeds of what would soon be their own native arts. Traveling Shaolin monks were responsible for the birth of several hundred styles of Kung-Fu. They would teach Chuan-Fa to their family, friends and followers and they, in time, would alter and add on to the style, then call it whatever they wanted - usually after their family name. Japan, during this time, began to proliferate schools of wrestling and swordsmanship; these would later become Sumo and the arts of Kendo. The earliest forms of Kenjutsu are thought to have existed as early as the 6th century A.D. and were most likely developed from techniques exhibited by Buddhist monks and scholars relating what they had learned abroad. The antecedent of this was to be seen in the transmission of Ch'in Na from China to Japan in the early 900's A.D., becoming the basis for Aiki-Jutsu. In Korea, early developments in Taekyon and Subak (the base arts of Tae Kwon Do), Hwarang Do (the ancient military art form) and Tang Soo Do, traditional Korean martial art with legendary influence by China (literally T'ang Hand Way) were interpretations of Wai-Chia, the external systems of Chuan-Fa. The northern external styles were known for their intricate kicking techniques....and once these were combined with the spectacular acrobatics of the native Korean kicking arts, the two made for a formidable union. The highest level of becoming one with self can be viewed at reaching songin. Copyright © 2018 Manna's Martial Arts, Inc.